The 2016 Integrated Program in Biochemistry (IPiB) Retreat brought new students together with current students, faculty, post doctoral scientists, and researchers to connect with each other both personally and about the research taking place in the program. The event was held Friday, Sept. 9 at the Wisconsin Institutes for Discovery and is put together by the program's Student Faculty Liaison Committee, particularly the organizing chairs Brian Carrick and Dana Dahhan. IPiB is the joint graduate program of the Department of Biochemistry and the Department of Biomolecular Chemistry. "We had an overwhelming turnout at this year's IPiB retreat," Dahhan says. 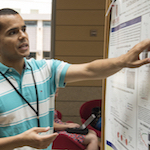 "The high attendance at every talk, as well as the strong support at poster sessions demonstrated the interest sparked by our faculty, staff, and student presenters. That we were at standing room only at many of the talks and had to spontaneously extend our reception because of all the faculty conversation spoke to the enthusiasm shared by members of our program." The event featured 12, formal 20-minute talks from faculty speakers, graduate students, and a post-doc, as well as two one-hour poster sessions and free meals for those who registered accordingly. The organizers chose the speaker lineup because it represents not only diverse research topics but also faculty at different stages of their careers. The retreat is one of the first glimpses that first year graduate students get at the exciting research taking place in the department. Because IPiB students rotate in different labs at the beginning of the program, this time is critical for them to see posters and hear talks to explore their many options. "Brian and I are very proud of the event we assembled, but we recognize that improvements can and should be make," says Dahhan. "To that end, we are soliticing suggestions for improvements to the poster judging process. Those comments can be directed to my email." For more photos see our Facebook album from the event.